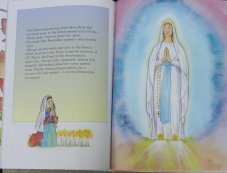 CATHOLIC GIFT SHOP LTD - A Moving Story of Saint Bernadette told to Children a Large and colour full Book. A Moving Story of Saint Bernadette told to Children a Large and colour full Book. Let children discover Saint Bernadette, through this wonderful colour book, beautifully illustrated, an unforgettable story which your child will love here over and over again. The story of the apparitions which took place in 1858."